During the hustle and bustle of the day, I don’t always get to sit with her and talk her through all of the paperwork. When I first started my job at the schools, I did not realize how much my supervisor was doing behind the scenes (e.g. 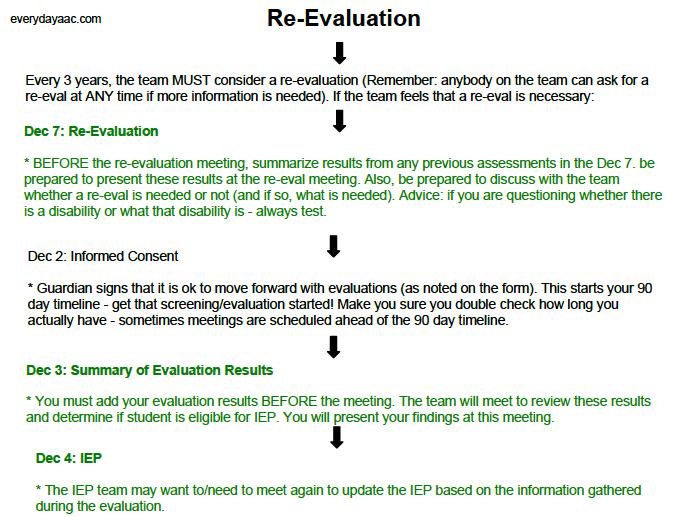 many forms exist other than the IEP). 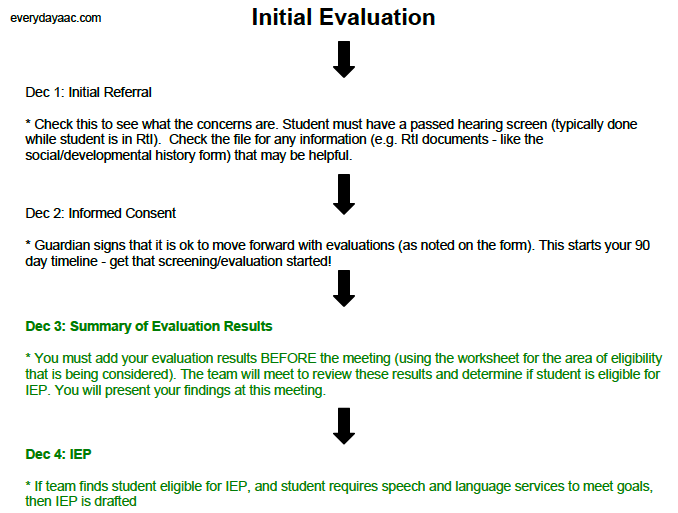 So, I’ve created a graphic to help explain what paperwork needs to be completed (in NC) for initial evaluations and for re-evals. I’ve highlighted paperwork the SLP is responsible for completing in green. Hopefully these are helpful! In my district we are so fortunate to have Program Facilitators, who facilitate (go figure) much of this process. These wonderful individuals handle forms like the Dec 5 (Prior Written Notice) and Dec 6 (Informed Consent for Initial Provision of Services). The link to all of the forms can be found here. Many districts are moving to web based platforms to complete these forms – which comes with it’s own set of pros and cons. In any case, paperwork is a necessary part of our job. I like to think of it as a system of checks and balances to ensure that proper steps are followed for all. My last piece of advice: It’s so easy to use acronyms and technical jargon when completing these forms. Remember: these should be accessible to all – event those who are not familiar with school based terminology. When in doubt, explain everything. Did I miss any steps? How does your district handle paperwork? Basically, the IEP is a bridge to close the gap between where the student is functioning and the Common Core standards (in most cases). 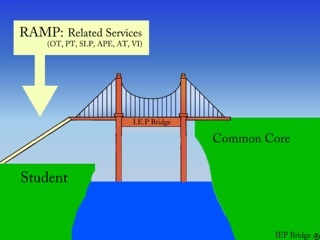 Related services (including SLP, PT, OT, and AT) are needed when a student can’t even access the bridge. These services are the on-ramp to the bridge. Once a student is on the bridge, these supports can be removed. A student may still have language deficits, but these deficits may not keep him/her from getting on that bridge. I’m curious as to how other school based professionals view related service supports. Are there any other theories out there? Enter your email address to follow EverydayAAC and receive notifications of new posts by email.